UNDER CONSTRUCTION! blu is Okaloosa Island's first new-construction offering in nearly a decade. A premier Gulf-front condominium of coastal contemporary design. Plan B is a spacious 1,837 sq ft, 3 BR 3 BA residence with a media room & 235 sq ft expansive terrace. Interior appointments include porcelain tile, gourmet kitchen, quartz countertops, gas ranges, stainless appliances, tile backsplash, designer cabinetry, full size washer/dryer and owner closets. Property amenities include 2 gulf front pools, one heated, together total over 4,500 sq ft and front 313' on the Gulf, fitness center, jetted hot tub, grilling area, fire pit & gated entrance with privacy wall. Short term rentals & owner pets allowed. Limited availability at current pricing. PURCHASE your residence TODAYPlan B is a spacious 1,837 sq ft, 3 bedroom 3 bath Gulf Front south facing residence with a media room. Enjoy amazing sunrises and sunsets from your expansive 235 sq ft terrace that is 29.4 feet facing the beach and up to 10 feet deep. In the living/dining is a twelve foot sliding glass door which opens to your private outdoor living area. This roomy plan offers plenty of space for enjoying life at the beach in the living and dining area that are 16'6" feet wide and 24'2" feet deep giving you just a little over 40 feet of gulf front living space. The large open gourmet kitchen appointments include a center island perfect for additional seating, 3 cm quartz countertops, gas range, stainless appliances, tile backsplash, designer cabinetry and a pantry. The master suite features eight foot sliding glass doors giving access to the terrace and a window that will provide sweeping views of the gulf. The luxurious master bath contains an oversized frameless shower, lavish soaking tub, quartz countertops, dual vanities and a private water closet. Porcelain tile flooring is located in the foyer, hallway, kitchen, living and dining room, master bedroom and all baths. One of the guest bedrooms offers a private en-suite bath which functions perfect as a second master suite. This residence contains a separate laundry room with full size washer/dryer and an owner's closet. Complimenting silence and privacy are the interior solid core masonite panel doors and keyless entry door. 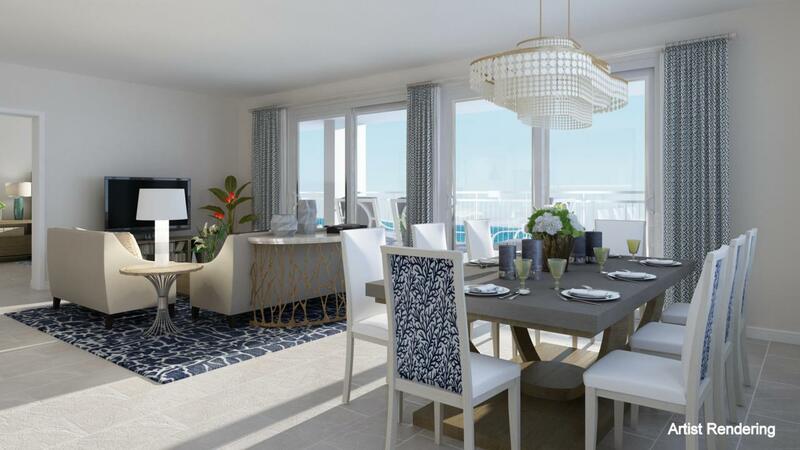 Combining chic coastal elements with clean, contemporary design and the area's natural beauty, blu brings a new dimension to exclusive gulf front living on Okaloosa Island. The unmatched way of life at blu offers stunning views, unspoiled shoreline, and a contemporary touch the island has been anxiously awaiting for nearly ten years. This one-of-a-kind community is ideally located to feel removed from the hustle and bustle, yet moments away from area restaurants, abundant water sports, marinas, endless shopping, spas, parks, and a wealth of local entertainment. Now is your opportunity to own a brand new piece of paradise at blu! Imagine if you will, upon arriving through the gated entrance boasting an established sense of place and welcoming spirit, you are greeted by lush landscaping and a grand, two-story porte-cochre with complementary water features. This property's quality truly elevates expectations, with concrete and steel construction wrapped in white-sand stucco with cypress wood-style accents, while hints of blue dazzle across the building's high impact tinted glass windows. To purchase your residence a 10% deposit is due at firm contract with an additional 20% due at time of construction; for a total of 30% non-refundable deposit.